The Vanguard VEO 265CB Tripod is the first best travel tripod? You know or don’t. Don’t take it seriously because we are going to give you a wide review of the Vanguard VEO 265CB Tripod. Today many photographers or influencers decide to make the decision to invest in a tripod to obtain the best shot with the best angles. Because with this type of objects it is possible to have stability so that the camera does not move, in the same way, it allows the individual to fix the camera to the inclination and height that is desired, thus avoiding its movement when making the shot. And there’s nothing better for a good shot than a tripod that manages to capture the essence you want to convey to the viewer, that’s why Vanguard shares its new product. We review the 265 CB tripods, which is already on the market. Vanguard VEO 265cb tripod advantages – Why it is best travel tripod? Vanguard is known worldwide for its innovative products that transmit reliability and multi-functional tripods that provide stability to the user when making a shot. The Vanguard VEO 265cb tripod is used by most people who want to travel and at the same time save those memories when taking pictures, the best of this tripod and the reason why it has become so popular in the market, is thanks to its lightness, because when it is made with carbon fiber it only weighs one kilo. 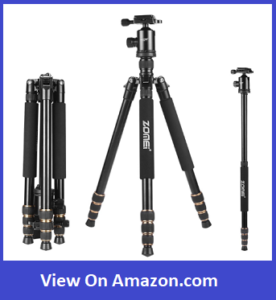 One of the qualities that amaze users is its central column, which can be folded on itself to reduce the size of the tripod to a height of thirty-nine centimeters. This tripod has three legs, which are divided into five sections, which allow the user to reach a maximum height of one hundred and fifty centimeters, it must be added that it has a button with which the tripod can be positioned in three different openings, in one of them can be left at ground level to obtain a minimum height of forty centimeters. These legs have a special support system capable of adhering to any surface on which you want to make the shot, from places with vegetation or sand, to urban centers with ceramic floors. It should be noted that it has a ball-shaped ball joint that makes a very good friction control. The Vanguard VEO 265 CB tripod does not have many of the qualities found in the different tripods that Vanguard has brought to the market. Many of the models of this company, such as Alta Pro, only have a multi-angle central column and achieve a much higher height, support much more weight and therefore also have much more weight, however, these tripods also retain similarities with the VEO 265 CB, because they have special support on the legs, are innovative, of a very good quality, are listed as one of the best supports in the market, their designs are modern and come with a bag in which you can easily transport the tripod to any place and space in which you want to use. 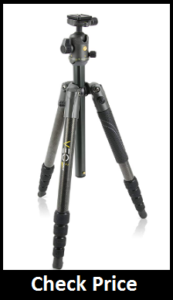 The new Vanguard tripod is easy to use, has a magnificent support and adapts to any terrain, so it makes it the best travel companion for any individual who wants to travel light and at the same time prepared for any eventuality, since You can carry it as a suitcase and store it in any space of the briefcase and thanks to its functionality you can get the best pictures.